We have highlighted relevant sections. What this review confirms is that the US and its NATO allies are on an active war footing. US-NATO military exercises, training and planning are being regularly conducted on Russia’s doorstep in Eastern Europe, the Caspian Sea and Black Sea basins and the Baltic states. Whereas Russia is not mentioned, these various military initiatives and “defensive” war games threaten the Russian Federation. They involve the participation of troops from several NATO and NATO partner countries including the US, Germany, the Netherlands, Bulgaria, Romania, Georgia, Azerbaijan, Denmark, Hungary, Poland, Spain, Portugal. What these articles and reports suggest is that Washington is anxious to mobilize military forces within NATO and NATO partner countries without the need to deploy a large number of US troops. The message said that the conference on coordination of bilateral relations between Azerbaijan and the United States in the defense sector took place in the Training and Education Center of Azerbaijani Armed Forces. From the Azerbaijani side, the event was attended by representatives of the relevant departments and services of the ministry of defense, the three kinds of air forces army, from the US side – by the representatives of the European Command, the military attache and the Office of Military Cooperation of the Defense Department. EINDHOVEN, The Netherlands: NATO assessed its alert procedures for the Very High Readiness Joint Task Force (VJTF) for the first time during Exercise NOBLE JUMP from 7-9 April 2015, involving over 1,500 personnel from 11 Allied nations. Germany, Poland, Norway, Denmark, Hungary, Lithuania, Croatia, Portugal, and Slovenia tested their Headquarters’ response to alert procedures and high-readiness units from The Netherlands and Czech Republic physically deployed equipment and troops to airports and railheads.This activity represents an important milestone as NATO continues to respond to emerging security challenges. The exercise has its origins in last year’s Wales Summit, where NATO leaders collectively agreed to establish the VJTF, or what some call the ‘NATO Spearhead’ force. These developments are part of wider enhancements to the NATO Response Force in order to address instability on NATO’s southern and eastern flanks.”NATO military planners have been working tirelessly to enhance NATO’s Response Force and implement the Very High Readiness Joint Task Force, and today our progress is manifested in the rapid deployments we see happening in locations across the Alliance,” said General Philip Breedlove, Supreme Allied Commander Europe (SACEUR). “These measures are…a clear indication that our Alliance has the capability and will to respond to emerging security challenges on our southern and eastern flanks,” he said.For the last several months, NATO has been developing the concepts behind the VJTF and established an interim force early in 2015. Exercise NOBLE JUMP marks the first time that high-readiness units have physically tested their response to rapid ‘orders to move’ under the new VJTF framework. The training event marks a learning process that will allow NATO military staff to identify both successes and shortfalls as the Alliance continues to refine its high readiness capabilities.Czech and Dutch High-Readiness Troops Put to the Test In the afternoon of 7 April, the 11th Air Mobile Brigade in The Netherlands and the 4th Rapid Reaction Brigade in the Czech Republic were given orders to rapidly prepare to deploy their troops and equipment.“In the hours that ensued, Dutch and Czech formations recalled their military personnel to base, conducted hasty movement planning, briefed personnel, prepared and verified equipment, weapons, supplies, and vehicles,” said Colonel Mariusz Lewicki, the head military planner for the VJTF at SHAPE. “The lead troops were able to move in under eight hours, with all elements moving in under 48 hours, so our initial impression is we are very pleased with the results,” he added.The Commander of the Dutch 11th Air Mobile Brigade, Brigadier-General Kees Matthijssen, also felt that Exercise NOBLE JUMP achieved its aims.”So far we are satisfied, our men and women responded well to the alerting and we managed to send off the first troops as scheduled. We are sure that we will be able to meet our goals, which were to move all troops and equipment within 48 hours,” said Brigadier-General Matthijssen. “Of course, we have noted some things to improve during the exercise, but this will definitely lead to further refinement and improvements of our high readiness plans,” he said.A total of 900 German soldiers were also recalled to their units in Marienberg, Gotha, Idaroberstein and Bad Salzungen during Exercise NOBLE JUMP. These troops conducted similar planning and alert verifications in their respective garrisons. “Alfa” Company of the 12th Battalion of I Light Infantry Brigade of the Georgian Armed Forces is going through a month-long field-based training. The North Atlantic Alliance representatives will evaluate the combat readiness of the military unit due to engage in the NATO Response Force. During the field exercise, 116 servicemen of “Alfa” Company will be trained according to a combined arms tactic. The basic part of the preparation will be devoted to practical exercises. The soldiers will practice in search and cordon, patrolling, attack and defensive operations. They will undergo staff, engineer and medical preparations as well.The training course launched on 1 April and will last till the end of the month. After completing the field-based preparations, the military unit will take part in the Joint US-Georgian Exercise “Noble Partner 2015”. A month-long training ongoing in field conditions includes preparing the military for this upcoming combined exercise too. NATO completed the first military drills for its new rapid reaction force, on Thursday (9 April 2015). From Tuesday (7 April 2015) through Thursday, more than 1,500 troops took part in exercise “Noble Jump,” designed to test whether troops assigned to NATO’s new Spearhead Force, or Very High Readiness Joint Task Force, could be ready to deploy 48 hours after receiving an order-to-move.Across Europe, headquarters personnel from Croatia, Denmark, Germany, Hungary, Lithuania, Norway, Slovenia, Poland and Portugal tested their responses to NATO alert orders. In the Czech Republic and the Netherlands, troops and equipment were assembled quickly at airfields and railway stations as if they were about to depart. The units involved in this week’s exercise will also be involved in further trials in Poland in June.“NATO military planners have been working tirelessly to enhance NATO’s Response Force and implement the Very High Readiness Joint Task Force, and today our progress is manifested in the rapid deployments we see happening in locations across the Alliance,” said General Philip Breedlove, Supreme Allied Commander Europe. “These measures are defensive, but are a clear indication that our Alliance has the capability and will to respond to emerging security challenges on our southern and eastern flanks,” he said. Turchynov sees NATO as Ukraine’s main priorityKYIV:The main priority for Ukraine is its membership in NATO, as it can provide real security.Secretary of the Ukrainian National Security and Defense Council (NSDC) Oleksandr Turchynov has stated this during the draft national security strategy presentation, an Ukrinform correspondent reports.”Having abandoned the policy of non-alignment, which did not provide the territorial integrity of our country in the medium term, relying primarily on own capabilities, Ukraine reserves the right to take part in collective security systems as a way to guarantee sovereignty and territorial integrity. Sharing common values with the European Union and NATO, Ukraine considers European and Euro-Atlantic integration as its priority in foreign and domestic policy. 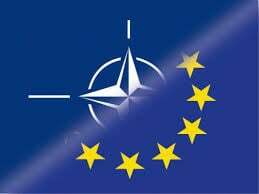 We see NATO membership as the only reliable external guarantee of state sovereignty and territorial integrity of Ukraine,” he said. KYIV: The main foreign policy priority for Ukraine will be strengthening of the partnership with the United States as the sole guarantor of international security within the Euro-Atlantic area.This has been announced by secretary of the National Security and Defense Council of Ukraine Oleksandr Turchynov at the presentation of the draft national security strategy until 2020, an Ukrinform correspondent reports.”The strategy identifies that the main foreign policy priority is deepening the partnership with the United States as the guarantor of international security within the Euro-Atlantic area,” Turchynov said. In addition, Ukraine is committed to the development of a “privileged partnership” with the United Kingdom, Poland, as well as Canada, Australia, Japan, Lithuania, Latvia, Estonia, Sweden, Romania, Moldova and Georgia – the countries, which Ukraine considers to be its “reliable allies.””The partnership with Germany and France, the member states of the EU and NATO, is also a priority of our foreign policy,” Turchynov noted. PRAGUE: A NATO exercise called Nobel Jump was held in the town of Chrudim in the Czech Republic, it was reported Thursday.”The exercise is designed to examine the activation, planning to deploy some functionality and command, control and support that are needed to drive to go out and perform tasks as ordered,” Czech Deputy Chief of Staff Jiri Baloun was quoted as saying.Miroslav Hlavac, commander of the Rapid Deployment Brigade, said that the exercise involves more than 200 soldiers and 80 pieces of military equipment. Some 150 Czech soldiers from the 43rd Parachute Battalion joined the NATO exercise. A similar exercise was held in the Netherlands at an air base in Eindhoven at the same time.The training is the first part of Exercise Noble Jump, the second part will continue in June in Zagan in western Poland. There will be a simulated crisis to test the capacity of the deployment of allied troops from Germany, the Netherlands, Norway and the Czech Republic. Bulgarian National Assembly ratified the agreement for the deployment of a NATO switchboard battalion in Bulgaria.The communication-information system or the so-called NATO module will be constructed near Bulgaria’s Gorna Malina.The deployment of a communication battalion of NATO in Bulgaria has been supported by 120 MPs in Parliament Thursday, with 21 voting in favor, and 5 of them abstained. Heated debates on the topic started Wednesday with a scandal between representtaives of the nationalist parties ATAKA and Patriotic Front. Leader of ATAKA Volen Siderov catеgorically opposed the bill, stating that the center will be used in the future for coordination of military action on the territory of Ukraine. The party urged for Bulgarian authorities to announce neutrality in order to avoid possible military threats….In 2009 NATO’s Military Committee and the North-Atlantic Council took the decision for Bulgaria to host a national mobile communications module as a part of the Second Communication Battalion to NATO. Additionally, two higher officers and 55 sergeants that will be provided by Bulgaria. Namest nad Oslavou: An exercise of Czech forward air controllers started at the helicopter base in Namest today by the arrival of four A-10 Thunderbolt planes from the U.S. air forces´ 354th fighter squadron seated in Germany, base spokeswoman Jana Skrivankova has told CTK.The POP UP A-10 CAS military exercise, which runs through April 17, will take place without live ammunition in the area normally used for the training of air support in the vicinity of Trebic.The U.S. planes landed in Namest at round 14:00.Training flights should start as of Thursday.”They will be on workdays from 09:00 until 23:00. Night flights will be limited to the necessary minimum,” said Skrivankova. The Czech air force have long been developing cooperation with the United States in this field, she added.The participation of the A-10 Thunderbolt aircraft during the training should extend the Czech forward air controllers´ (FAC) skills in the operation of state-of-the-art equipment for the identification and surveillance of targets.Soldiers will also train in the night using night-vision devices and develop communication skills in English, Skrivankova said.In addition, the exercise should focus on the development of skills of the 22nd helicopter base in the provision of logistic support for the 65-member U.S. unit, including catering, accommodation, fuel and communication and information connection. The Ample Strike 2015 national exercise will also train the harmonisation of forward air controllers with the crews of tactic planes and helicopters during operations. It will be held in cooperation with NATO member states on August 31-September 22. Sixteen NATO members confirmed their participation at the beginning of the year.